It’s happened again. Almost your entire sales team has missed their quota for this quarter. Some missed by just a little, but many missed by a huge amount. Obviously, it’s the goal of every sales manager to ensure that their team is reaching their goals. But if your sales team is having serious trouble hitting quota, is there anything you can do about it? You have the ability to steer your sales team back towards success and get them on track to hitting their sales quotas consistently. Here’s the secret: you just need to understand the root of the problem. In this article, we’re going to discuss eight issues that may be causing your sales team to flounder. We’ll also show you eight proven solutions that will allow you to get your team back on track. Problem #1: You set unrealistic sales quotas. How you set your sales quotas will have a direct impact on whether or not your team will hit them. When your sales quotas are unattainable, your team will struggle and miss the mark over and over again. And this doesn’t just look bad on paper; it keeps the stress level at a maximum and could lead your team to burn out. That’s why all sales quotas must take into account the abilities of your team. Solution: Set realistic sales quotas. First, you’ll need to calculate the past performance of the team as a whole, and as individuals. You’ll also need to compare this past performance with seasonal factors or differences in territories or markets. Next, do research into current market trends. For example, let’s say your sales team sold $10,000 worth of product last quarter. However, the new quarter has started with a sudden drop in demand. Obviously, setting a sales quota that is the same or higher than what your team did last quarter will only end in failure. So, make sure your sales quotas reflect the current market situation. Once you have a clear view of what your team is capable of doing, you’ll have a better understanding of where to place your sales quotas. Pro-tip: Learn about the 7 habits that reps need to crush their quota. Problem #2: You don’t have a well-defined sales process. Did you know that 40% of companies don’t have a well-defined sales process? That’s just crazy, because the companies that do have a playbook to follow have a win rate of over 50%! If your sales team is consistently missing their sales quotas, it could be that their sales process isn’t well-defined, which could cause them to waste time deciding how to proceed with leads. Solution: Set up a sales playbook. What makes your customers tick? What’s the average sales cycle length? How many points of contact are necessary to close a lead? What’s the most common catalyst that turns prospects into customers? Analyzing past sales and understanding what makes a successful process is key to helping your team sell more efficiently. It’s also important that your CRM reflect the sales process that your company uses. That way, your team knows exactly how to proceed with each lead. Another essential aspect of your sales playbook: an overview of the role that each team member plays in the sale. As the sales manager, you must understand the strengths and weaknesses of each member on the sales team. Are some better at cold calling? Who works best through email? Which team members excel at warming up new leads, and which work better as account managers? Knowing the best roles for each team member allows you to create a sales process that plays to multiple players’ strengths. In fact, today sales teams are working together to seal bigger deals, with most enterprise-sized companies involving 5–11 team members in each sale. Giving each member a well-defined role within the sales process helps the whole team work more efficiently to nail those sales quotas. Problem #3: Marketing and sales aren’t well-aligned when it comes to leads. Imagine this situation: marketing is working hard at getting new leads together, but your sales team has a hard time keeping track of the leads they send. Worse still, it could be that your sales team ignores the warm leads that the marketing team is sending altogether! Solution: Guide marketing and sales towards working together. While marketing and sales used to be two separate entities within your company, new data suggests that these teams need to be well-aligned in order to succeed. In fact, companies that align marketing and sales have 36% higher customer retention rates, as well as 38% higher win rates. So, when the marketing team presents new leads to the sales team, what happens? A study by the Harvard Business Review found that over 24% of companies took more than 24 hours to respond to new leads, and 23% never responded at all! This is incredible considering the HBR study also found that companies that respond to new leads in less than one hour are 60 times more likely to qualify a lead than those who wait 24 hours. As the sales manager, you need to make sure that the marketing and sales teams are well-aligned, allowing reps to respond to new leads while they’re still warm. Problem #4: You don’t provide enough individual coaching. According to one study, more than half of all businesses have ineffective coaching programs for their sales team. This has a lot to do with the time spent on coaching. In fact, while the average sales manager spends 15 hours in one-on-one conversations with their team, only a quarter of this time is allocated for coaching. But here’s the crazy part: effective coaching has been directly linked to greater revenue for your company. The same study found that companies who provide good coaching programs for their sales team see 16.7% better annual revenue growth than companies who don’t. If your team isn’t getting effective coaching, they could be seriously lacking in the skills they need to sell more and hit their quotas. Solution: Set up routines for assessment and coaching. First, it’s your job to find out what’s going on with your sales team. As we mentioned before, you should know the strengths and weaknesses of each team member. To start, take your sales playbook and see how well each team member goes through each step. Don’t just focus on the results: see how each team member works through the sales cycle. Is there a spot where they tend to get stuck or lose the prospect? Next, take a serious look at what your customers are saying about your company. (And your sales team!) You might send them a friendly survey asking about their experience, or check the reviews they post online to websites in your industry. This will help you understand your team more fully. Finally, set a regular program of one-on-one coaching for each team member. This doesn’t have to be the same tone of a performance review: it can be a friendly conversation over a cup of coffee. You’re here to offer advice and support, so let your team feel that genuine interest! Coaching your team through specific opportunities or on tasks such as pipeline management, qualifying prospects, meeting prep, and so forth can help them to progress as salespeople. This, in turn, will help them hit their sales quotas! Problem #5: Your sales team lacks key industry knowledge. Did you know that 40% of all salespeople can’t understand customer pain points? However, the salespeople who do understand their customers are 28% more likely to hit their sales quotas. If your team is having trouble sealing the deal, the problem could be with their understanding of the industry and their customers. When salespeople don’t understand their customers, they’re missing out on key knowledge that will help them move prospects through the sales funnel. Solution: Train your sales team to understand their prospects. If your sales team lacks knowledge, it’s time for them to get training. This could be part of your coaching program, or it could be a special training held for the whole team. Either way, you need to make sure your team understands their prospects. What are the most common pain points for companies in your industry? What makes them turn away from their current solutions? What problems do they face on a daily basis? And, most importantly, how does your product help solve their problems? Once your sales team understands these essential factors, they’ll be better equipped to make more sales and hit their quotas. Problem #6: Your team is short on motivation. Another reason your sales team might not be hitting their quota could have something to do with motivation. What currently motivates your sales team to move forward and push for more sales? Most companies use commissions to motivate salespeople. While this common practice does have merit, there are other ways to reward your team and get them even more fired up to reach their sales quotas. If your team is missing their quota, you might need to find a way to re-motivate your salespeople. Solution: Mix up your rewards system. Some companies place a cap on the commissions that top sellers can earn. While this is done to control costs, it can easily backfire and cause your company to miss out on higher revenue. 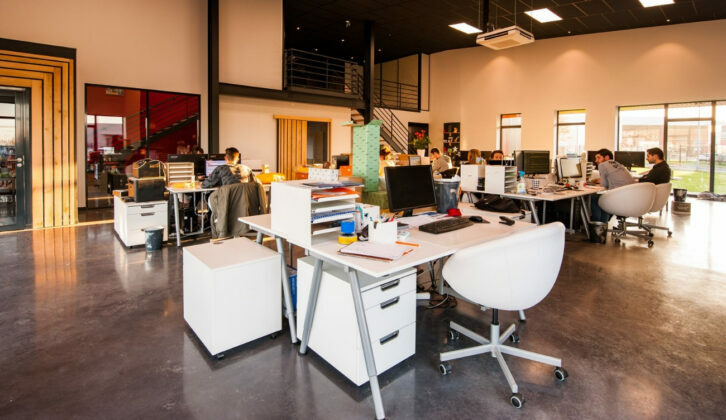 For example, a study by the Harvard Business Review found that when one company removed the ceiling on commissions, they were able to motivate top sellers and increased revenue by 9%. Another great way to motivate your team is through prizes, whether these are paid vacations, office perks, or fun experiences such as having the boss cook you a meal. The best way to work prizes into your rewards system is to offer multiple prizes to different winners. The same study from HBR found that awarding multiple winners motivated star performers to work harder since it opened up the playing field to others on the team. When everyone has a fair chance at winning, your whole team will be even more motivated to keep selling. Problem #7: Your team is burned out. If you’re seeing serious issues with your team’s ability to perform, they may be experiencing sales burnout. In one survey of people in sales, 33% of respondents said they have no work-life balance at all, and 51% have been told by family and friends that they work too much. These are sobering statistics that show just how close to burnout your team could be. Solution: Give your team the ability to enjoy a healthy work-life balance. As a sales manager, you need to be aware of the mental and emotional state of those who work under you. Do you notice a change in the attitude of your sales team? Are some team members showing up to work looking disheveled or with dark circles under their eyes? How do they sound when you speak with them? Have they lost joy in their work? It’s also important to monitor the hours that your team is working. Research shows that after working more than nine hours, fatigue starts to set in and performance drastically decreases. Doing this repeatedly can lead to burnout. If you see signs of burnout on your team, encourage them to take a few days off of work. You could even set up events for your team that allows them to take their mind off selling for a few hours when they’re really stressed. Problem #8: Your team spends too much time on administrative tasks. 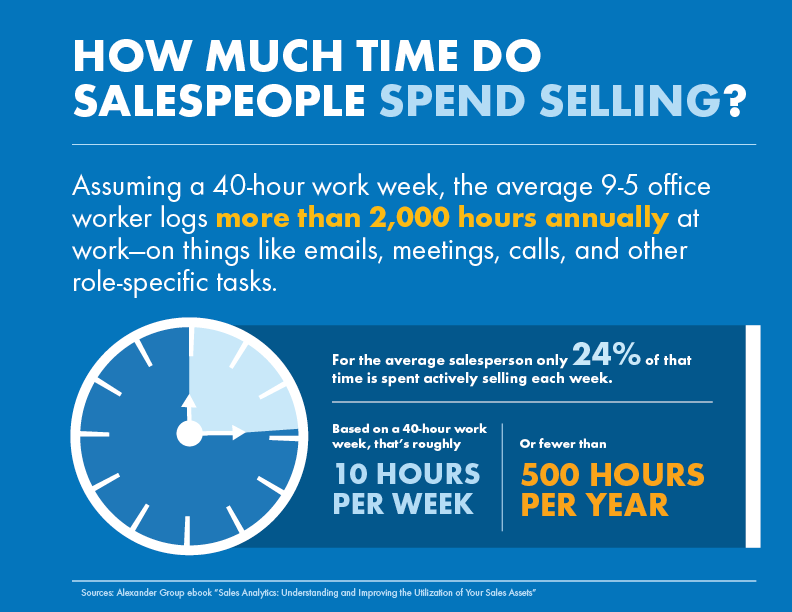 Did you know that the average salesperson only spends 24% of their time selling? For anyone who has ever worked in sales, you probably understand the feeling. While selling is the main part of a sales rep’s job, there are myriad other tasks that get in the way. So, how can you help your sales team spend less time on data entry and other tasks, and more time on selling? Solution: Help the whole team get more use out of your CRM. Your CRM is meant to help your team be more efficient and sell more effectively. But are your salespeople really getting the most out of your CRM? According to The CRM Benchmark Report, over 40% of business professionals in small businesses waste 2–5 hours per week on manual data entry in their CRM. In medium-sized businesses and enterprises, almost 30% of respondents reported spending a whopping 6-10 hours a week on data entry. To stop this from happening, make sure that your salespeople really understand how the CRM works. Give extensive training that allows them to see where they can make shortcuts and save time. Also, help them to integrate the CRM into the tools that they use in their daily sales process, such as G Suite. Are you ready for your sales team to hit quota (and go beyond)? While maintaining a happy sales team isn’t easy, you can help each individual to reach their sales quotas by understanding the problems above and employing the right solution. Whether it means setting more realistic sales quotas, creating a sales playbook, pulling your sales team from the brink of burnout, or motivating them with a different reward system, your input can make a huge difference in the team’s performance. Help them hone their skills and become the best salespeople they can be by coaching your team individually and giving them the training they need to work within the CRM. You as the sales manager have incredible power, and yes, great responsibility. So, get out there and help your team become the best version of themselves!